Memes fly around the internet like quantum accelerated particles. Some are fun, some are informative, others are utterly ridiculously wrong. Unfortunately people get caught up in pretty pictures with inspiring – or is that insipid – quotes printed on them, so they start following someone on social media, someone who spreads as much nonsense as inspirational quotes. At face value there is a great message from Twain about not storing up emotional baggage. 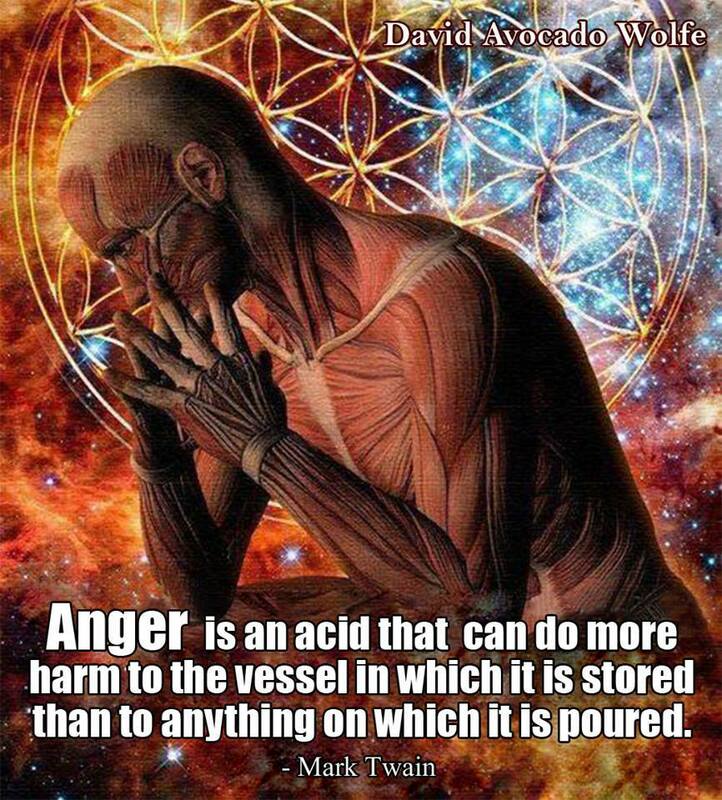 Let’s just ignore the scientific inaccuracy of how acids work and how the materials of the respective containers and the Ka (acid dissociation constant) of the acid are going to be the deciding factors in how much damage the acid does. But once you move past the quote and pretty picture you start to notice certain things about the picture, namely that there is some weird design stuff going on it. There’s some spacey looking stuff in the background, there’s a person with no skin, and some sort of lattice work design: what the hell is this stuff? That’s called the Flower of Life, something that has been incorporated into Sacred Geometry, a load of nonsense that would have Mark Twain penning scathing insults toward; Twain loved science. Again we have a bit of text that implies that good relationships are much deeper than the shallow, fleeting, physical attraction. This one is, however, more obvious in its ridiculousness. In amongst the rainbows and pretty city the two outlines of people are hovering above, there are glowing lights in the bodies of the people. Take a guess at what they are meant to be. Chakras. That’s right, we’ve gone all new-agey nonsense right out in the open. So once you spot the new-age nonsense you realise the word “soul” isn’t being used in the allegorical sense but in the “I believe all sorts of rubbish” sense. This is a typical health meme that these sorts of social media pages post: half truths, misconceptions, lies and nonsense. 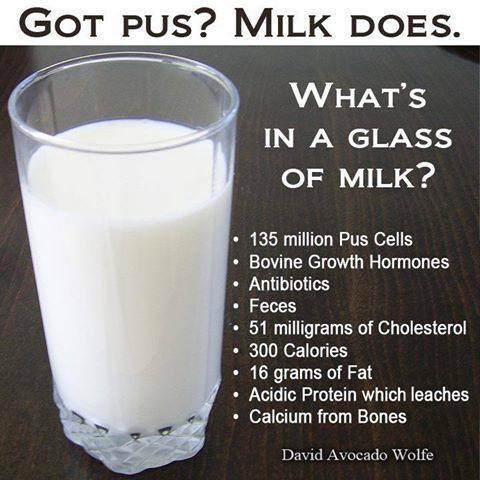 Let’s start at the top: there are no pus cells in milk. The meme seems to be referring to the somatic cell count of milk, which is not the same thing, and just part of the biology fail on display here. The 135 million figure is from the detection levels for mastitis in cows, which says that uninfected cows will have less than 150,000 cells/mL (they’ve clearly scaled up to a litre of milk in that glass, which doesn’t look like a litre glass to me). Growth hormones: misleading at best. Food has hormones in it, produced by the food, be that plants or animals. Remember how soy is meant to be good for menopausal women? Yep: plant hormones. So milk will have naturally occurring hormones in it. Some countries have limited/banned the use of growth hormones in animal production, others have allowed it. And this brings us to one of the many reasons pasteurisation is used in milk production, as it breaks down most of the hormones. Antibiotics: nope, they test every truck of milk as it leaves the farm gate to make sure there is no antibiotic contamination. Feces: again this is misleading, and also one of the main reasons for pasteurisation. You aren’t so much going to end up with feces in the milk as the bacteria associated. So it is important to kill the nasties and why raw milk is considered dangerous. Cholesterol: I’m not sure where they got the figures from but they seem to be assuming 200 mL of full fat milk. Odd considering they were assuming 1,000 mL for the pus/somatic cells. Yes, milk has 24 mg of cholesterol per 100 mL. And that isn’t necessarily a bad thing. Calories: I’m not sure why food having calories in it is bad…… Figures are roughly correct for 200 mL of full fat cows milk though. Fat: Again, I’m not sure why food having fat in it is bad. Acidic protein: This one is quite funny because there are a lot of acidic proteins. And obviously these acidic proteins leaching calcium from bones is one of those things that “mainstream medicine is ignoring” – aka the rallying cry made by purveyors of nonsense. Pity that dietary protein (which can include dairy) has actually been shown to be good for bones. The issue here is actually a couple of health myths. The first is the acid/alkaline diet that is utter nonsense. The second is the overstating of health benefits of milk, specifically as they relate to bone health and osteoporosis development. Now I’m not saying that milk is bad for you, but it also isn’t the most awesome drink ever made – that would be whiskey. Milk should be like whiskey: consumed in moderation. The point about memes is that they are only as good as their creator. The intention of the above memes is clearly to help people, inspire them to lead better lives, even if it is by showing them some pretty pictures with brain droppings written on them. But sadly it is obvious that these memes were created by someone who is not in touch with reality, which makes their health advice something to be avoided. Beware the meme: it could be nonsense! Thanks for tackling the one about the contaminated milk. My BIL has been going on about it and I’m glad to have some sources for reference. Yeah, these health scammers influence far wider than the people they are selling stuff to. They rely on no-one challenging them so that the misinformation has taken hold by the time we’ve had a chance. Good luck! Conrats, you are now the Sherlock Homes of the MEMEs. We know the truth because of you. Good luck spotting the other billions superficial memes all over the internet. My tingling Sherlock sense is telling me this comment is being facetious. Previous Previous post: Book vs Movie: Fight Club – What’s the Difference? Book vs Movie: The Lost World - What's the Difference? What does the Australian term "sheila" mean? Book vs Movie: Hellboy - What's the Difference?